Game 4 of the Western Conference finals will tell us if the return of Serge Ibaka has completely changed the series, making the Oklahoma City Thunder suddenly favorites against the suddenly slightly stunned San Antonio Spurs, or was his recovery mostly about a one-game impact that isn’t going to last once Gregg Popovich makes the proper adjustments. An interesting stat from the game was that the Spurs actually had a worse effective field goal percentage when Ibaka wasn’t on the floor( those 18 minutes), so it might be more of an appearance effect than one of substance. But no one could ignore Ibaka blocking four shots and making Tony Parker look up with hesitance every time he got in the paint, and completely mess up the Spurs’ offensive rhythm. It might be that Ibaka’s return finally straightened something out for the Thunder on both sides. Scott Brooks has given up on using Thabo Sefolosha and Nick Collison, because he doesn’t really need great perimeter defenders. Not when he has the option of playing two big men who clog the paint and rotate between three of them, resorting to smaller lineups on a very rare basis, something that didn’t work in the first two games. Ibaka helps clog the paint but is quick enough to step outside, while Kevin Durant, Russell Westbrook and Reggie Jackson have the speed to rush out and disrupt previously open shooters. Sefolosha gave them nothing offensively and so did Collison, although Collison will probably find his way back to the rotation, even if it means limited time on the floor. 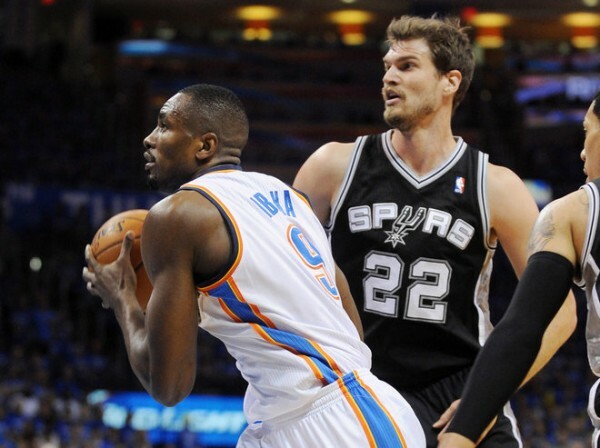 While Tim Duncan handled the return of Ibaka earlier on, getting more time with Kendrick Perkins or Steven Adams on him, Tiago Splitter struggled with the length and timing of Ibaka on the block. Minutes with Boris Diaw, who is a much better passer than Splitter even if he doesn’t have the same arsenal of post moves, were better. 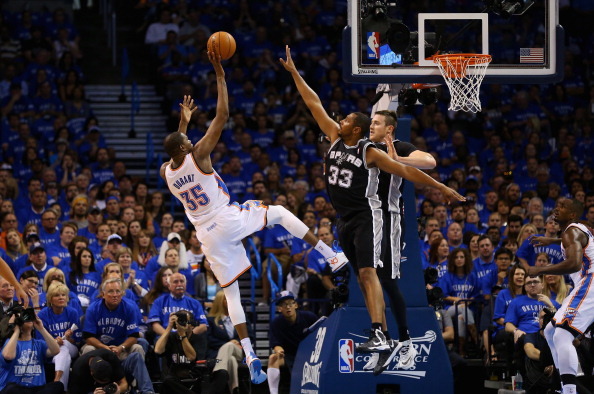 Diaw can back down bigger defenders and has much better vision of the floor. Popovich also has the option of using smaller lineups, which usually give the Thudner a lot of problems. Tony Parker might need more time with Manu Ginobili next to him, although now the two of them have injuries, serious or not, somewhat limiting their play, or at least that’s what we’re told. In any case, the Spurs can’t afford to have so many minutes on the floor with a playmaker that’s severely under performing. If the Thunder win game 4 and tie the series, all the ghosts and ghouls from the series in 2012 will come up. Even for a team that’s been through everything like the Spurs have over the years, there’s no doubt there’s a sense of fear when the Thunder get hot on account of what happened this season and in the past. Keeping the beast at bay and finding an answer to a defense that overwhelmed them in game 3 will be the key in this one, and probably for the whole series.